Why should I do exercises regularly that will build my strength? For starters, many exercises improve balance and flexibility, increase bone density, control weight, reduce heart disease and improve sleep and overall mood. The better question: Why wouldn’t I do strength training? First, answer these 4 questions from the National Institutes of Health to find out how much you know about strength training. If you didn't get at least 2 correct, you may want to do some additional research. If you have been inactive or have health concerns, talk with your physician before beginning a program. And if you experience swelling, pain or other discomfort after you start, stop and contact the doctor. To start a strength-training program, you might want to enlist the help of a personal trainer or join a health club and work with the staff. A health club also gives you easy access to weights and other equipment. Like other exercise programs, begin with a 5-minute-or-so warm-up by walking, biking or using aerobic equipment. 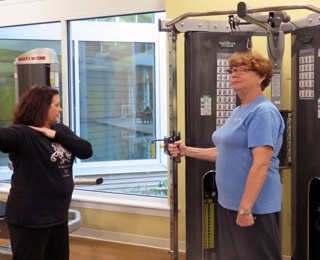 The “Strength Training for Older Adults” guide, compiled by Tufts University and the Centers for Disease Control and Prevention, lists several exercises you can do without any special equipment. Squats strengthen hips, thighs and buttocks. Stand directly in front of a sturdy chair. Your feet should be slightly more than shoulder-width apart. Extend your arms so they are parallel to the ground. Place your weight more on your heels than on the balls of your feet. Bend your knees as you lower your buttocks toward the chair in a slow, controlled motion while you count to 4. Pause. Then, slowly rise back up to a standing position as you count to 2. Keep your knees over your ankles and your back straight. Repeat the squat 10 times. This equals 1 set. Rest for about 1 minute. Then complete a second set of 10 squats. Wall Push-ups strengthen arms, shoulders and chest. Find a wall that is clear of any objects, such as wall hangings and windows. Stand a little farther than arm’s length from the wall. Face the wall, lean your body forward and place your palms flat against the wall at about shoulder height and shoulder-width apart. Bend your elbows as you lower your upper body toward the wall in a slow, controlled motion as you count to 4. Keep your feet planted. Pause. Then, slowly push yourself back until your arms are straight as you count to 4. Make sure you don’t lock your elbows. Repeat the wall push-up 10 times for 1 set. Rest for about 1 minute. Then do a second set of 10 wall push-ups. Toe Stands strengthen calves and ankles. Stand with your feet shoulder-width apart near a counter or sturdy chair. Use the chair or counter for balance. Slowly push up as far as you can onto the balls of your feet as you count to 4. Hold this position for 2 to 4 seconds. Then, slowly lower your heels back to the floor as you count to 4. Repeat 10 toe stands for 1 set. Rest for about 1 minute. Then complete a second set of 10 toe stands. Step-Ups, using a set of stairs, improve balance and strengthen legs, hips and buttocks. Stand next to a handrail at the bottom of a staircase. With your feet flat and toes facing forward, put your entire left foot on the first step. Hold the handrail for balance. As you count to 2, place your weight on your left leg and straighten it as you slowly lift your right leg until it reaches the first step. Make sure your left knee stays straight and does not move forward past your ankle as you’re lifting yourself up. Let your right foot tap the first step near your left foot. Pause. Then, use your left leg to support your weight and slowly lower your right foot back to the floor as you count to 4. Repeat 10 times with the left leg and 10 times with the right leg for 1 set. Rest for about 1 minute. Then do a second set of 10 repetitions with each leg.